Do you know what changed? Config Changes of Cisco Unified Comms. 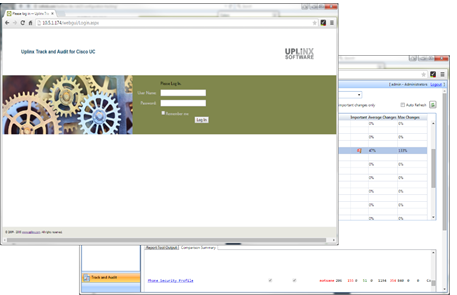 UPLINX Track & Audit is an enterprise-grade, web-based configuration management system for Cisco Unified Communications that automatically backs-up and tracks configurations to enable version and revision control. With multiple administrators making configuration changes, Track & Audit helps you to easily review what, when and who made these changes. It empowers you to quickly identify changes and to roll-back to the previous settings when problems occur. Using a scheduler, Track & Audit generates configuration- and comparison- (diff or change-) reports for all Cisco Unified Communications servers and stores them to a report repository. Reports can contain every configuration item of Cisco Voice with all settings. 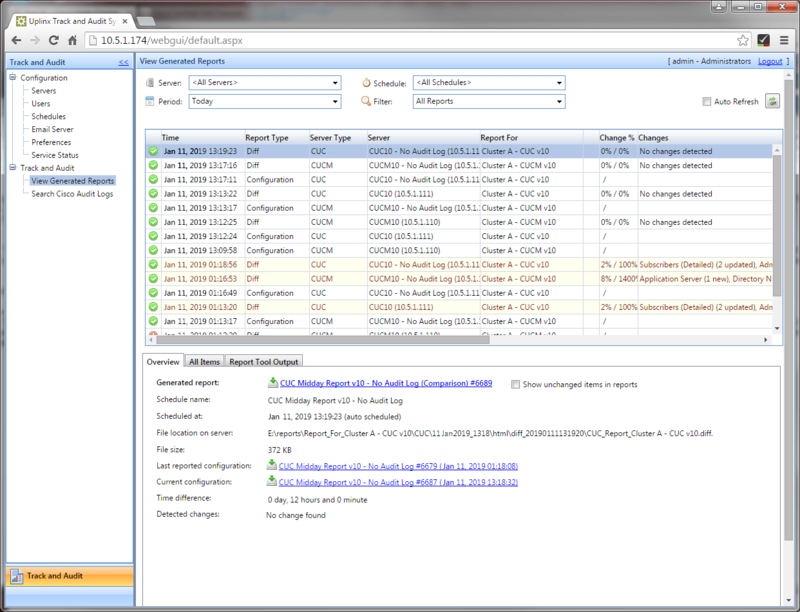 The Web interface allows you to easily define which configuration items are documented in the report. Critical configuration elements to be monitored can easily be defined on the web interface. Any CUCM, IMP or CUC configuration item such as device pools, CSS, route patterns, users, translations, and other system-relevant items such as trunks or voice gateways, can be automatically monitored and trigger email notifications to an administrator if they are changed. With UPLINX Track & Audit, you can easily generate configuration- or comparison reports that contain detailed configuration changes to Cisco Unified Communications – see who, what and when. These audit reports and email alerts contain a list of changes to easily track, log and review any changes. They tell you what the old value was and what it has been changed to. Automatically backup configurations for all Cisco Unified Comms servers. Recover from accidental deletions and restore prior configurations. Identify how much work has been done, when and by whom. Roll-back to previous versions in case of system failure or user issues. Email alert administrators of changes to critical components. Easily define monitored configuration items. Review easily and quickly any changes made incl. userid, date and new and old values. Configuration reports that contain Who, What and When? UPLINX Track & Audit creates audit reports that show configuration changes - who, what and when - in Cisco Unified Communications. Cisco Audit Logs are automatically merged to increase the accuracy of changes found and to provide evidence of who made the configuration change and when it was made. UPLINX Track & Audit automatically generates and stores configuration reports for backup purposes in its report repository. You access it by web browser, via user authentication with access controls, to view generated reports by server or date. 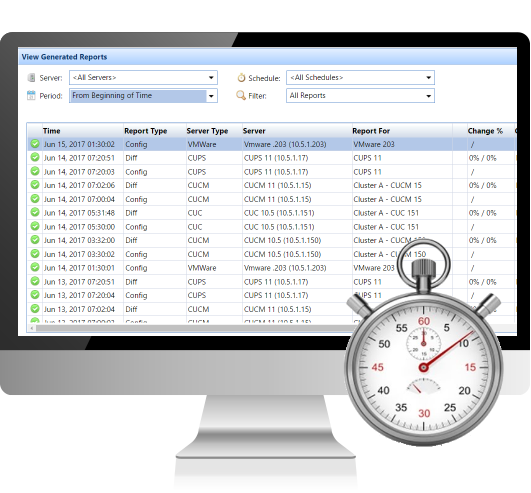 Simplify your review process by searching for changes in reports and Cisco Audit logs, or specify a search for critical configuration changes. Receive email alerts when backups have been completed or only when critical configuration changes have been made. 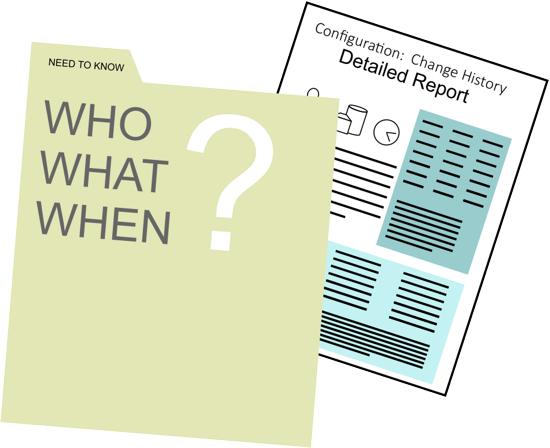 Audit reports show when, what (old and new setting) and who made changes to the Cisco CUCM, CUC or IMP configurations. Configuration reports and audit (change- or diff-) reports are automatically generated to identify any change made. Audit reports can be accessed via the Track & Audit Console by any web browser. Access can be controlled per user and limited to specific servers. Define triggers which monitor and track important system configurations - such as route patterns or voice gateways - to alert administrators by email. 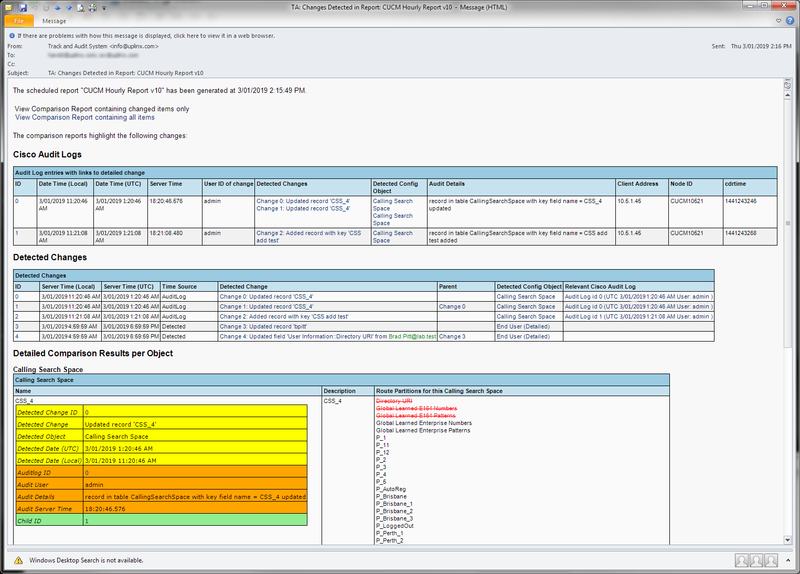 Search in Cisco Audit logs and identify all affected configurations from the Audit Log Console. Identify faulty changes quickly and then manually revert configurations to the last known good state. Configuration reports and audit logs are automatically generated and stored. Self-sufficient, unique configuration management system for Cisco Unified Comms designed with security. 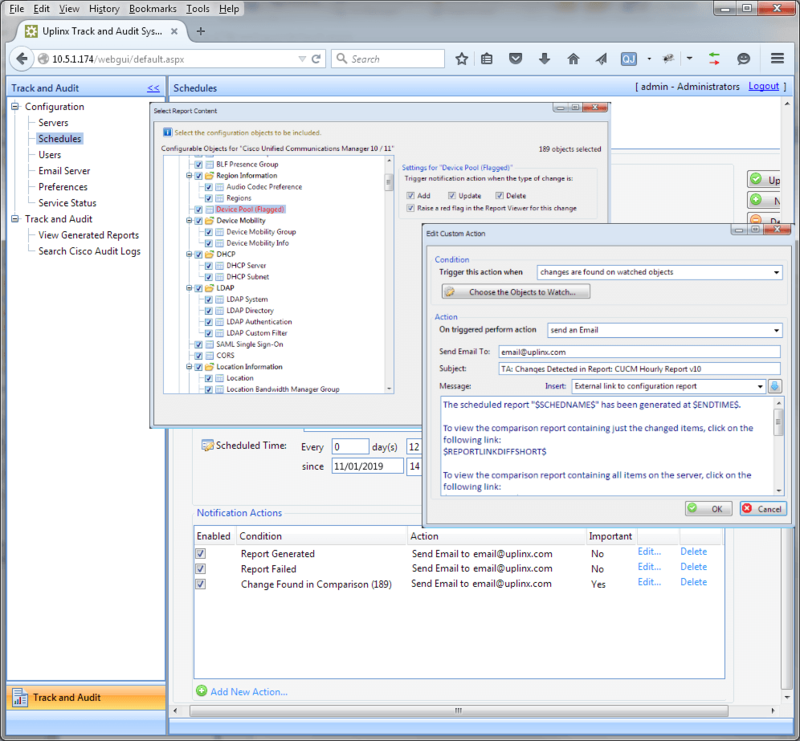 Centralized, web-based solution running on Windows Server. Designed to operate multiple clusters in large and distributed environments. Multi-cluster, multi-user web based access with user access control. Cisco Server access only from Track & Audit server with firewalled security. Authentication of user logins via Active Directory means no dedicated passwords and no Cisco admin server access.